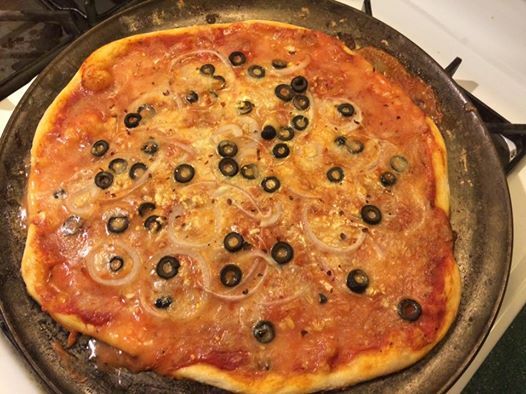 The Vegan Mouse: Pizza with Trader Joe's vegan cheese. Made this pizza for myself tonight after a pretty rough day. I used Trader Joe's vegan mozzarella which is interesting. It got sooo liquidy when it melted. It was sloshing out the sides of the pizza as I cut into it with a pizza wheel. Wacky. I like the taste. It has a very cheesy salty flavor. Pizza from school cafeteria comes to mind. It's not bad at all. Quite good actually but way too liquidy when hot out of the oven. I didn't give it a chance to cool so maybe if I had, it would have firmed up a bit. I'll see tomorrow as I have stored the leftovers for lunch. So far, Follow Your Heart is tops as far as vegan cheese goes. The Trader Joe's vegan shreds make delicious vegan mac and cheese, but I agree with you about pizza, too liquidy. Follow your heart is my favorite too! I actually don't like any of the daiya products except for the frozen cheesecakes. I occasionally buy TJ vegan cheese, but my favorite on pizza these days is the mozzarella recipe from Chloe Italian Kitchen!